Subtlety is really the hallmark of my art. 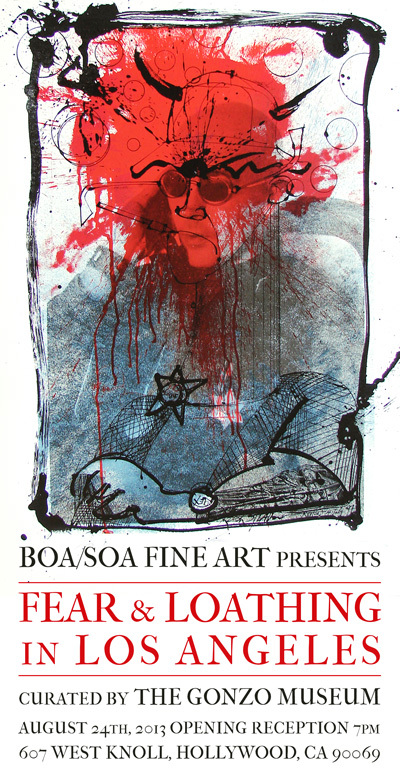 BOA/SOA Art Gallery is pleased to present Fear and Loathing in Los Angeles an exhibition in conjunction with the Gonzo Museum, which will be on view at the gallery starting August 24th, 2013. 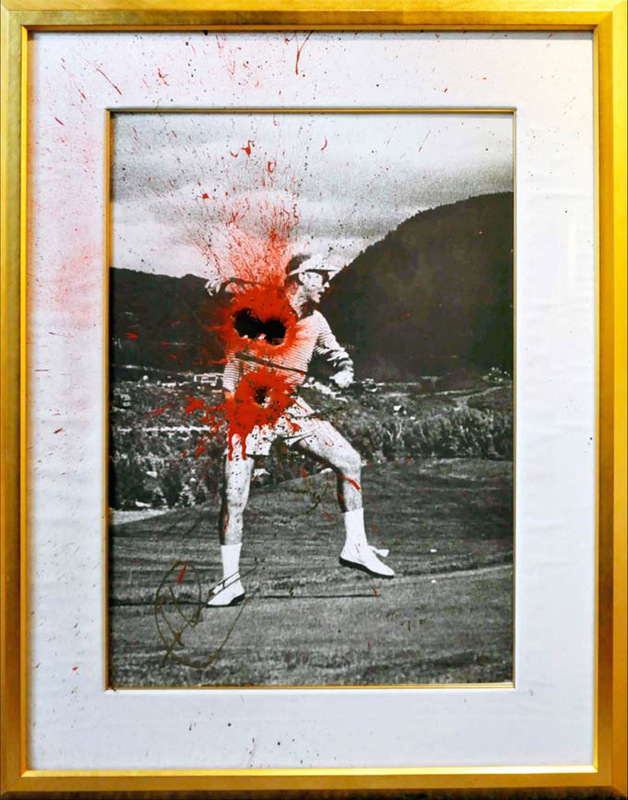 The exhibition will feature shotgun artwork by Hunter S. Thompson, signed prints by Ralph Steadman, vintage “Thompson for Sheriff” campaign posters by Thomas W. Benton as well as special works by William S. Burroughs and Warren Zevon. This traveling exhibition of thirty-six artworks marks the first time these works have been shown outside of the Gonzo Museum in Aspen, Colorado. These seminal works defined the gonzo aesthetic and became the symbols of an irreverent literary and journalistic style. In conjunction with the exhibition, The Cinefamily will be presenting two Gonzo films based upon the works of Hunter S. Thompson at the Silent Movie Theater, 611 N Fairfax Avenue, Los Angeles, CA 90036. The BBC documentary “High Noon,” a rarely seen film about Hunter’s run for sheriff will be followed by “Fear and Loathing in Las Vegas.” A selection of vintage posters from Thompson’s campaign for sheriff of Aspen will be on display at the theatre. Hunter S. Thompson (1937- 2005) was an American outlaw journalist and author, famous for his books; Hell’s Angels: The Strange and Terrible Saga of the Outlaw Motorcycle Gangs, Fear and Loathing in Las Vegas: A Savage Journey to the heart of the American Dream, and Fear and Loathing on the Campaign Trail ’72. Thomas W. Benton (1930-2007) was an American activist and silkscreen printmaker based in Aspen, Colorado, best known for his political posters. Benton created campaign posters during Hunter S. Thompson’s “Freak Power” campaign for the position of sheriff of Pitkin County in 1970, as well as the cover of Thompson’s work Fear and Loathing on the campaign Trail ’72. Ralph Steadman (1936- ) is a British illustrator best known for his art in the novels of the author Hunter S. Thompson including “Vintage Dr. Gonzo” and the iconic “Bat’s over Barstow”, which appeared on the cover of Thompson’s novel, Fear and Loathing in Las Vegas: A Savage Journey to the heart of the American Dream (1972). Let’s make it a celebration. PARKING? WHERE THE HELL DO WE PARK?